The ADA Portable Restrooms Trailer + 4 Station | Oahu Series is one of our most popular ADA units, featuring an efficient interior design. This unique floor plan includes 1 women’s suite with 2 stalls, 1 men’s suite with 1 stall and 1 urinal, and 1 ADA unisex suite, each with a separate entrance. Each standard stall contains a privacy stall pedal flush china toilet, sink with cabinet, and shatterproof mirror. 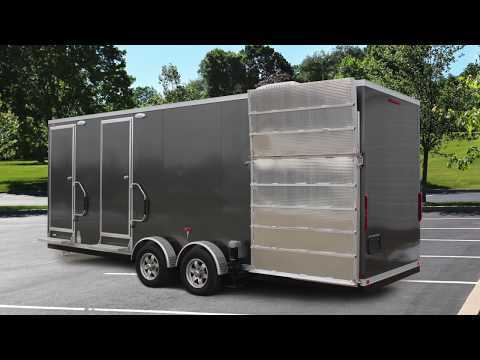 This trailer features a hydraulic lift system for the trailer to lower to the ground with the push of a button! The ADA-compliant unisex suite includes 1 ADA toilet, wheelchair-accessible sink, shatterproof mirror, and grab rails for assistance. This suite also allows for a full 360 turning radius for wheelchairs and additional assistance grab rails, important details that your guests will be sure to notice! This unit is climate controlled with A/C and heat strips, and contains a 135 gallon fresh water tank, and 750 gallon waste tank.